There are several different termite treatment options available depending upon your termite situation. Conventional termite treatment involves the use of liquid termiticides. We treat actively foraging termites using Termidor®. Termidor® is EPA registered and approved and is applied at very low rates. Typically, the active ingredient (fipronil) is just 0.06% of the finished solution. A Termidor® termite treatment begins with trenching. 6 -to- 8 inch deep trenches are dug along the exterior foundation walls where termites are actively foraging. Next, we inject the trenches with Termidor® until absorbed into the soil, we then back-fill each trench with un-treated soil. In certain instances when we are unable to trench because of obstructions such as roots or large rocks, we then treat the soil adjacent to the foundation by long rod, injecting Termidor® at 6″ -to- 12″ intervals. When it is not possible to trench because of concrete slabs, porches or blacktop surfaces, drilling is required. Slabs must be drilled vertically at 12 inch intervals and no more than 6 inches from the foundation. The soil below the slab must be treated from the bottom of the slab to the top of the footing. This method of drilling and treating is also used for dirt-filled porches and stress cracks sometimes found in slabs. Once the concrete or black-top is drilled, an appropriate low pressure injection method [liquid or foam] is used to treat below the surface of the slab. Following the injection process, all drill holes are then neatly sealed. When your home is treated with Termidor®, a “Treated Zone” is established around the home. With a Termidor® barrier in place, Termites can’t smell it, see it, or feel it. Since they don’t know it’s there, they forage freely in a treated area. Once a termite has ingested or contacted Termidor® treated material with its body, it becomes a “carrier.” Every other termite it contacts will be infected…which in turn infects every other termite it contacts. But Termidor® termite treatment works slowly, letting termites contact many others before dying themselves. With Termidor® there is no odor and no worry for people or pets. In situations where the infested structure is within 50 feet of a well or 100 feet of a body of water, termite baits and wood treatment applications may be the only treatment options. Adding foam enhances the coverage capabilities over conventional treatment methods. Generally, a combination of both foam and liquids are required on most treatments. The rapidly expanding action of Termidor® foam helps penetrate into remote areas where conventional liquids will not go or reach. Foam is primarily injected under concrete slabs, behind brick or other veneers, into framed walls, hollow block voids and shallow crawl spaces. Since gaps can occur under slabs when dirt settles, traditional liquids are not always able to provide complete coverage. Therefore, the soil not treated or the underside of the exposed slab provide pathways on which termites can travel. By using Termidor® foam, the foaming action of Termidor® is able to “carry” the pesticide up and onto the bottom of the slab. Termidor® foam also provides outstanding lateral coverage to the soil beneath. This has proved to be invaluable for some homes where settling has occurred underneath the slab. Termidor® foam does this by precisely targeting the potential problem area. In most cases foam treatments will provide outstanding coverage and produce results in a relatively short time frame. 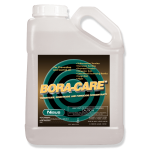 BORA-CARE® is a patented liquid formulation that protects structural wood from attacking wood destroying organisms. It contains disodium octaborate tetrahydrate also called DOT, a (“borate compound“) as the active ingredient and also contains glycol penetrants to help the active ingredient diffuse and permeate into the wood. BORA-CARE® works by eliminating wood as a food source and or harborage for termites, carpenter ants, wood-destroying beetles and decay fungi. A BORA-CARE® treatment is odorless, does not affect painting, staining or gluing and does not change the appearance of the wood. Most importantly, BORA-CARE® treated wood is nontoxic to humans and animals. BORA-CARE® provides double protection by acting as both a contact poison and a repellent to termites. As a contact poison, it will kill termites that come in contact with treated wood. University studies show that BORA-CARE® will provide 100 percent mortality to termites in just five days. This is an advantage, since termites are repelled or eliminated before wood damage occurs. Wood Injection: BORA-CARE® is the recommended treatment of choice for wood and wall void treatments. 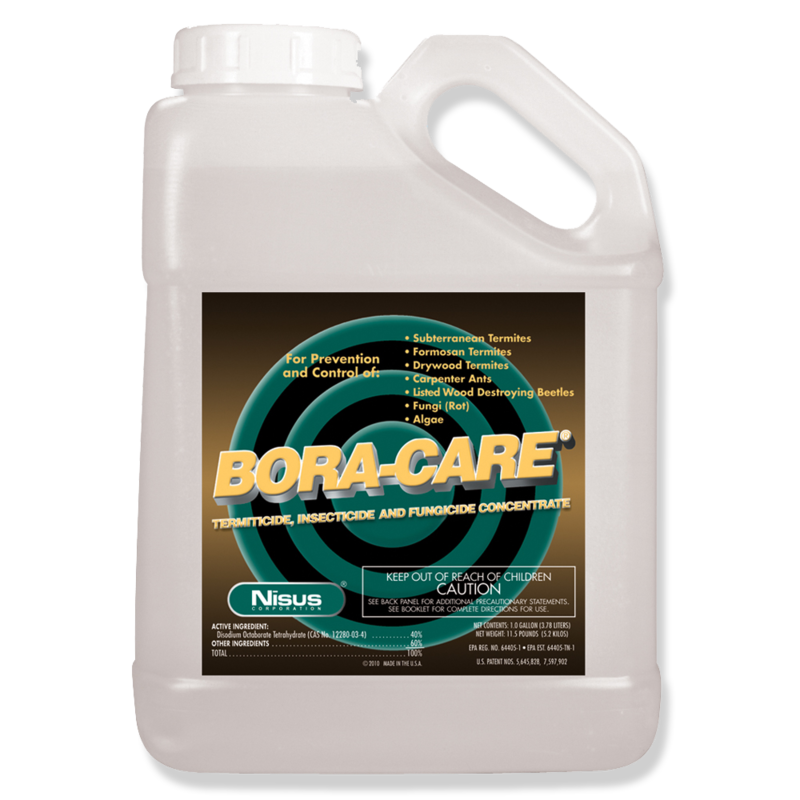 BORA-CARE® can be applied as a surface spray on areas such as sills, rim-joists and sub-flooring. Additionally, localized infestations can be treated by drilling small holes into the wood. Holes are then injected with BORA-CARE®, thus filling the termite tunnels inside the wood. Wall Void Foam Injection: Another technique for applying BORA-CARE® is foaming. In existing structures where construction is complete, wood can be treated without removing sheet rock or other wall covering by drilling small holes (at least one per void) and applying an expandable dry foam with the consistency of a shaving cream to the interior portions of a wall void. When we want to maximize horizontal coverage to specific areas, [e.g. on sill plates and around wall studs] a foam treatment both protects and provides the best coverage of imbedded termite infestations both on and inside the woods surface. Click here to see how the Advance™ Termite Bait System works. The Advance™ Termite Bait System utilizes the latest termite research and technology available. It features the ultra low disturbance station design that keeps termites feeding voraciously on the Puri-Cell™ bait matrix, which leads to colony elimination. The Advance™ Termite Bait System with it’s revolutionary dual stage station design is without question the best bait system to come along in the last 10 years… as well as the system we recommend above all others! Buying or Selling a home and require a Certification or Termite Warranty? North Jersey Termite can provide the necessary documentation for your closing. Looking for termite damage repair professionals? Click here for a list of “full-service” Independent Contractors that have experience with termite damage repair and structural carpentry including “sistering” as well as replacement of sills, floor joists and main beams. SAM/MIK Structural — Michael Battista (973)723-3131. Repairing structural termite damage, sill-plates main beams and floor joists. John E. McAuliffe — 908-245-9131. Damage repair as well as Termite Damage Studies (paid invasive inspections to determine amount of damage). Mr. Handyman — Bob Palmarozza — 973-696-9393. OMO Construction — David Baumser — 973-473-1766. T.C. Home Improvements — Tony Camaj — 201-522-9902. Frank Nydam Carpentry — 201-652-4160. A. Triant Construction — Anthony Triant — 973-764-8511.